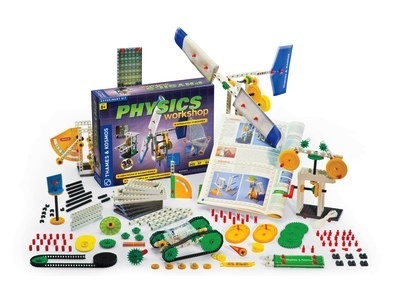 Physics is an essential science for everyone, and this kit provides a comprehensive explanation of mechanical physics. Through building 36 models and conducting subsequent experiments with the models, you will learn the fundamental laws of mechanical physics. Start by building small models, such as a fixed pulley, to learn about basic forces and simple machines. Then, work your way up to more complex machines, such as a pendulum clock, to learn more advanced concepts like work and centripetal force. This hands-on approach is both fun and effective because the principles of physics are demonstrated right in front of you. This kit includes more than 300 building pieces. The 64-page, full-color manual presents assembly instructions, experiments and explanations in a richly-illustrated, easy-to-follow manner. Build a windmill, two-speed crane, force scale, sail car, mars robot, hammer machine, centrifuge, pinball game, centrifugal switch, ship’s lantern, and dozens of other models Experiment with simple machines: gears, levers, screws, inclined planes, pulleys, wheels and axles Learn and understand the most fundamental physics equations Read about amazing real-world applications for physics.